Crafters take note: Julianna Hudgins is the complete package. She's a TV personality, jewelry designer, author, mixed-media artist, product designer, blogger, and creative sister and friend! 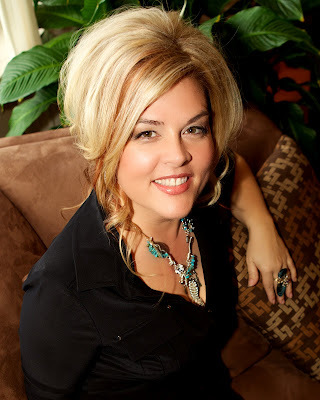 She's been dazzling audiences with her creativity since her days on Aleene's Creative Living. She's traveled the world and has even taught craft techniques at the Japan Hobby show in Tokyo! Her talents in paper crafting earned her the recognition of being one of the "Top Eight Scrapbooking Authorities" by the DIY Network. We're so excited to welcome Julianna a.k.a. Jewels to our crafty blog team starting next Monday, March 19th. You can expect a tutorial from her on the fourth Monday of each month after that! A whimsical piece using her new Spellbinders Jewel Goddess die and Artistic Wire. Hi Julianna. We’re so excited that you are going to be a part of our iLoveToCreate blog team! For those who don’t know you already, how would you describe your artistic style and what type of projects do you love to create? My artistic style is very dimensional, full of texture, intuitive and very feminine. I love creating jewelry pieces that feature antique crystalsand beads. I also enjoy paper crafting and giving new life to old things such as vintage bottles, recycled jars etc. 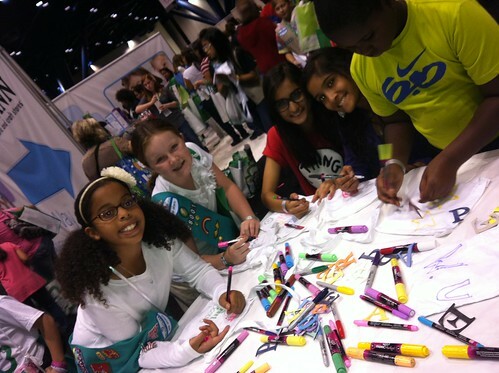 Julianna represented iLoveToCreate at the Girl Scouts 100th Anniversary Event and got to share her love for Tulip Fabric Markers with the girls! Do you have a favorite iLoveToCreate product? Well, my heart will always belong to the Aleene’s Adhesive line but I super LOVE the Tulip Fabric Markers and Paints. 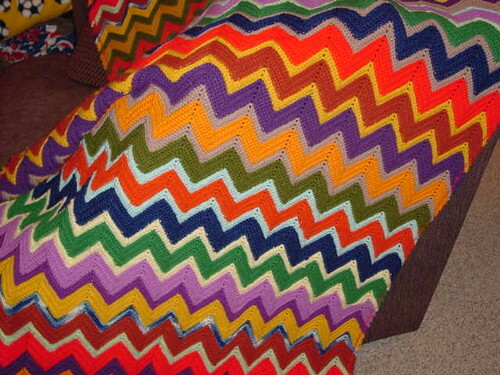 A colorful crochet blanket by Julianna's grandmother. Have you always been creative and crafty? What were some of your first creations? I was raised in a household of creativity. My Mother did Macramé, ribbon roses and ceramics while my Portuguese Grandmother created beautifulcrocheted blankets and sewed all of her clothes. I was lucky enough to create all of these items with my family. 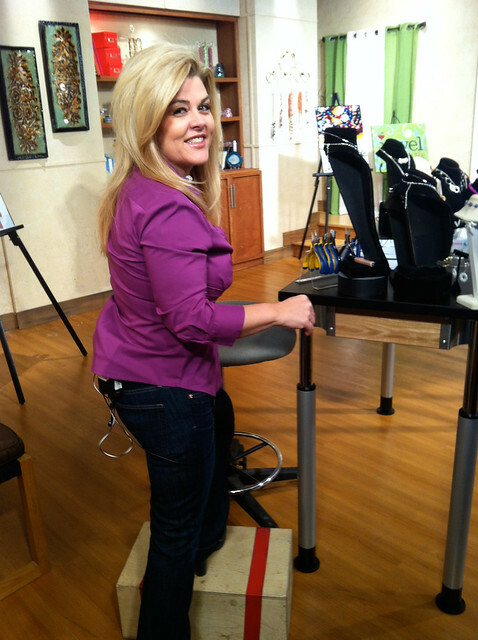 Julianna is ready to go on air at Jewelry Television. Notice the wooden box she has to step on to make her look taller during her appearance! You’ve been in the public eye for a while having made appearances on HGTV, PBS, HSN, QVC, and Jewelry Television. What’s your favorite part of being on air? Something comes alive in me when I am on air! I love the idea that I am inspiring people around the country to be creative and to live their bestpossibly life. I have received numerous thank you cards and emails from people thanking me for encouraging their creativity. This is the best gift of all! 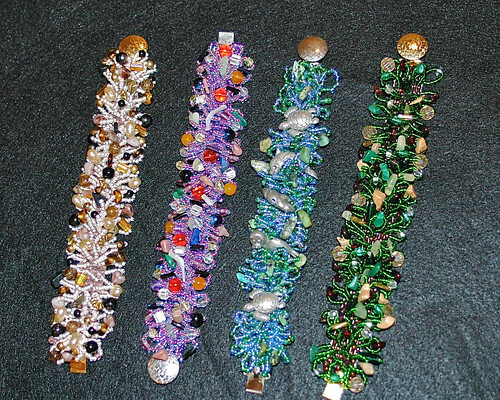 Julianna finds healing power in making these vintage Aleene's loom bracelets. Tell us a little bit about some of your favorite projects that you’ve created over the years. 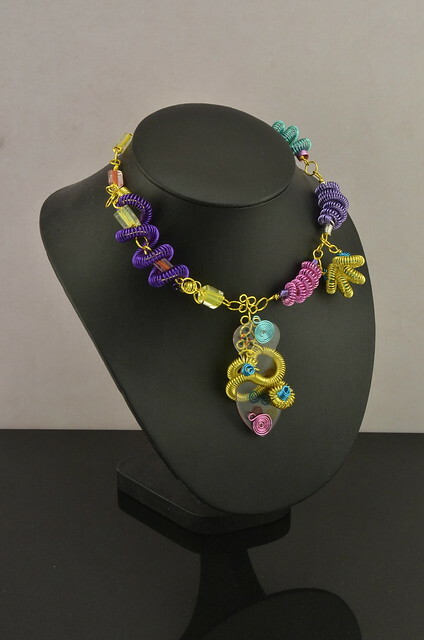 Some of my most favorite projects have to be my Vintage Aleene’s Bead It Loom Jewelry pieces. My dear sister friend Tiffany Windsor taught mehow to use the loom and as they say the rest was history! In fact, creating on the loom literally got me through one of the most painful loses of my life. When my Portuguese Grandmother passed, I was lost beyond words. She was my heart and soul. I rememberstaying up until 3:30 a.m. Making this bracelet out of the colors that inspired her. I truly believe that there is healing in being creative with your hands. Julianna and Tiffany, crafty friends for life. What artists and DIYers do you draw inspiration from? I am so inspired and motivated by my creative family Tiffany Windsor & Heidi Brochers of Cool2Craft. They have been with me from the start and have empoweredme to express myself creatively. I am also inspired by all of my Industry peers. There are so many talented woman and men in our creative world. A lot of my Inspiration also comes from nature, the sound of the ocean, the breeze in the trees and color! I LOVE color! 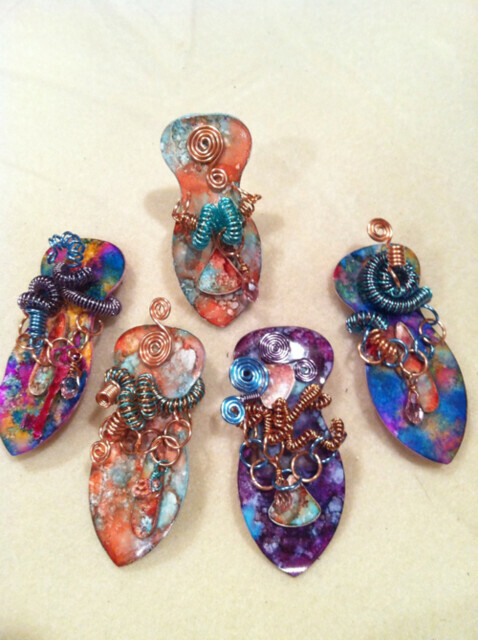 The new Spellbinders Goddess dies and beautiful finished pieces using the smaller die. You recently came out with a line of Goddess cutting dies through Spellbinders! Congratulations. Can you tell crafters what the process is like having your designs and art manufactured and then having that feeling of seeing the final result! Thank you! I am so thrilled to be working with Spellbinders. Stacey and Jeff Caron are some of the most giving and caring people that I have evermet. They truly embraced me and my ideas unconditionally. The process was awesome! Their team of creative experts worked with me on my concepts and sketches and helped to make them a reality. Seeing the packaged product left me speechless. I was so overwhelmedwith emotion. This has been one of the best blessings ever. I am forever thankful! OK, we can’t have an interview and not mention your hair! Haha. We’ve seen some pretty crazy hair crafts on those reality runway shows. What’s the wackiest way you’ve styled yours that would rival those looks? Well, I will just let the photo above tell that story! LOL! My hair was so teased that I could not get it to go back down. I was staying at myfriend Suze Weinberg's house in central Jersey so I had to drive from exit 9 to exit 3 on the Turnpike with this larger than life head of hair. I was laughing the entire way home! 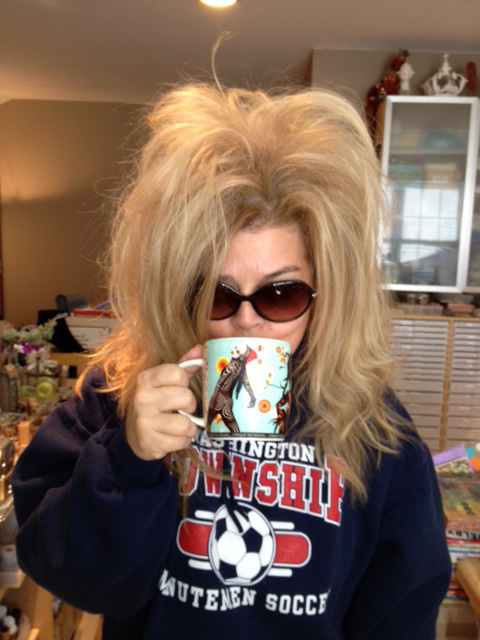 I am sure that most people just thought there goes a real Jersey girl, big hairand all! 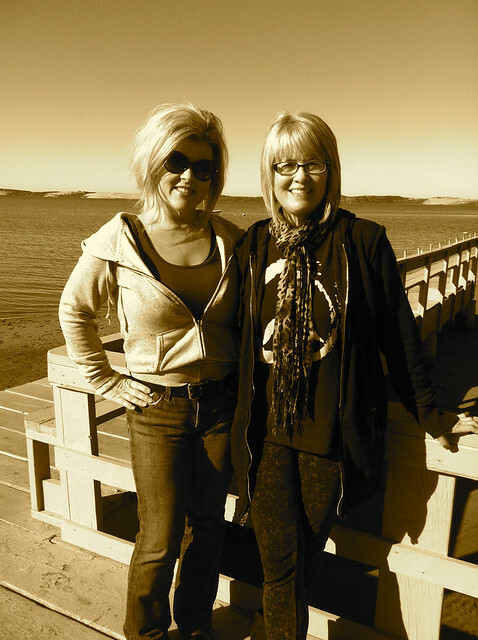 Learn more about Julianna on her blog Positively Me by Julianna Hudgins. Also follow her on Twitter, Facebook, and Flickr. I recently found my Bead-It Loom, do you know of any videos that show how to use it?